Very worthy choice Joanne! Chomsky and others have tons of research on the complicated relationship, filled with strong correlations, between language and thought with each at least influencing the other...and why Eskimos have exponentially more words for snow than we have in English. Slowly but surely, our rights, privileges, language(s), and our core values as Americans, is whittling away, day by day. The foreign relations with our allies, is also being chopped on the block all the while, this administration bows down the tyranny of this individual (dt). He has used this language on the campaign trail, but also with and to the press, and world leaders, relentlessly, in his speeches, and tweets. It concerns me greatly of his using his spiteful/hurtful words, and those close to this ID, say nothing. 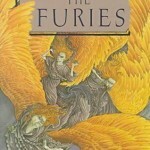 Thanks, Joanne and Furies for a great post. Language is very easy to manipulate. Words can become weapons. Love the Furies post. I agree with Pat's comment 100%. We really do seem to be losing our rights and privileges. I'm trying my best to do all I can do to voice and stand up for our rights. Great article, Joanne. Much to think about. Thank you too for pointing to our own responsibility in this as senders and receivers of language and all the good and bad that comes implied with it. THIS IS SUCH AN IMPORTANT ISSUE! BTW, that New York lawyer's building, whether he was there at the time, or not, was serenaded by a Mariachi band, and lots of people, singing "La Cucaracha," the other day! dumpy's rhetoric is responsible for many, many instances of violence against minorities. It is amazing that no group of people achieved a "fully human" rating in the surveys! Perhaps it is because so many people recognize just how inhumanly stupid so many people are😉.